Splinters can become quite a nuisance if left unattended. These tiny wounds caused by slivers of metal, glass, plastic or wood that penetrate through the skin may result in pain, irritation or an infection. Now, this isn’t an issue that usually calls for immediate medical attention. However, if there is bleeding or swelling, it is best to seek professional care. 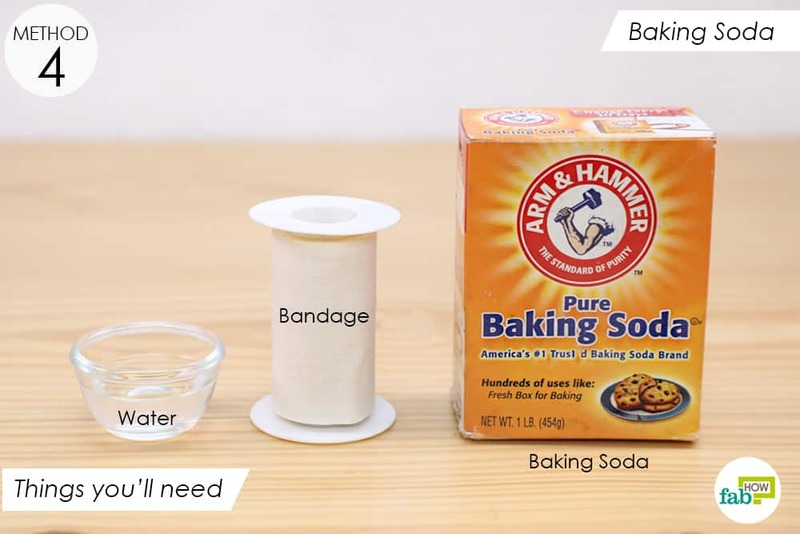 In most cases, a few common household items are enough to get rid of that annoying splinter! There are a number of easy remedies that can be used to heal the affected area and relieve the pain and irritation. Note: Before you begin, wash your hands and the affected area with soap and water and pat it dry. If someone else is helping you, ask them to wash their hands first. Here are a few easy-to-follow methods to remove a splinter without pain. Tweezers are one of the most common tools to remove a splinter without pain. However, if not carried out carefully and gently, the process of removing a sliver with tweezers can cause further damage to the affected area. Before you begin, you need to examine how big the splinter is as well as the direction from which it has entered the skin. If the splinter is very small, you can examine it with the help of a magnifying glass. If the splinter is deeply embedded in the skin, you may need to use a needle to push it out a bit. Note: If splinters are deeply embedded in the skin, infected or near a sensitive area like the eyes, please see physician or nurse practitioner for removal immediately. Sterilize the tip of the tweezers with rubbing alcohol. 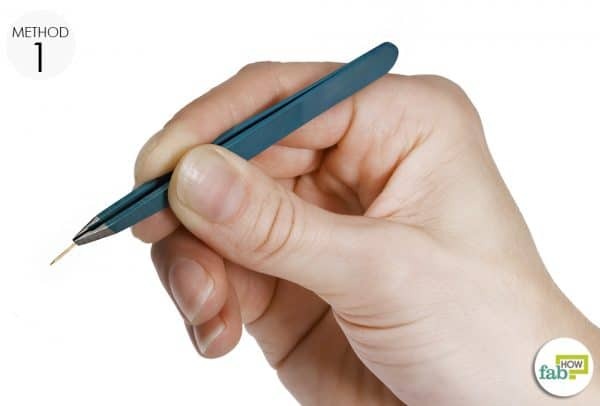 Using the tweezers, grasp the part of the splinter that is sticking out of the skin and gently pull it out. Avoid squeezing the affected area, as it may cause the splinter to break. You can also use a sterilized needle and rubbing alcohol to remove a splinter. Gently pierce the skin’s surface at one end of the splinter. Very carefully, use the needle to push out a part of the splinter. Then, use the tweezers to pull out the splinter. Quick Tip: Alternatively, apply a few drops of lavender essential oil on the area after washing it with warm soapy water and cover it with a bandaid. 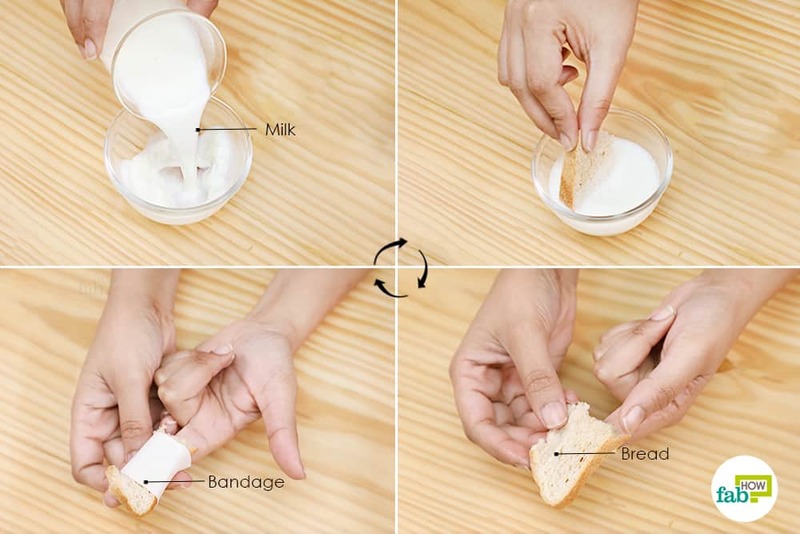 (3) Remove the bandaid after 2-3 hours and gently squeeze out the splinter. White glue or carpenter’s glue can be used for removing splinters that are not deeply embedded in the skin. This hassle-free and painless method is quite popular. Apply a few drops of the glue on the splintered area. Leave it on until it dries. Peel off the dried glue, preferably in the opposite direction of the path the sliver went in. The sliver will come out with the glue. Although the salt and grease present in bacon is not great for your health, it may prove to be helpful in removing splinters without pain. Bacon fat can help pull the splinter to the skin’s surface. 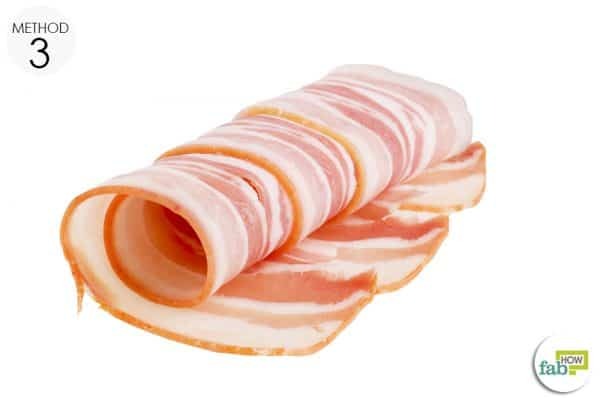 Cut off a tiny piece of white fat from the raw bacon slice. Place the piece of bacon fat on the affected area. 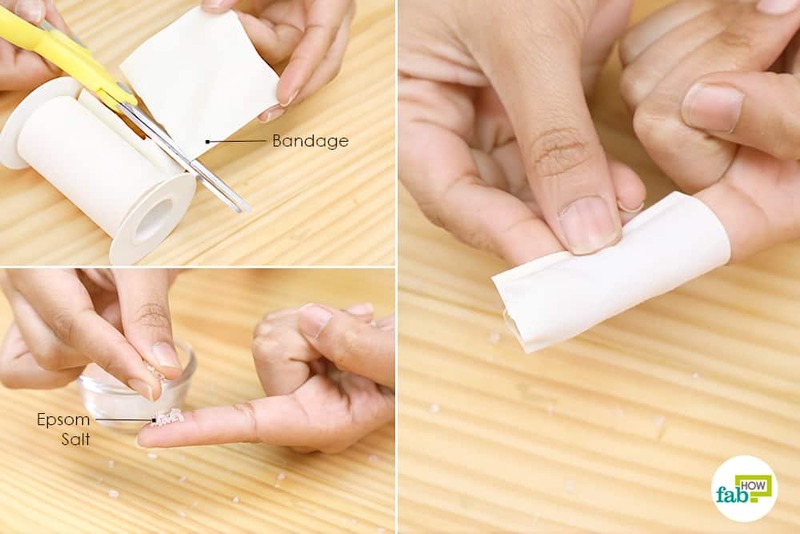 Hold it in place using a bandage, tape or string. For best results, keep the bacon fat on the splintered area overnight. Carefully remove it the next morning. The splinter should come out with it. If the splinter is still there, repeat the steps and wait one more day before removing the bacon piece. There’s a box of baking soda in the kitchen cupboard of almost every household. It can prove to be extremely useful for removing deeply embedded, hard-to-pull-out splinters. How does it work? It simply causes the skin to swell, thus pushing out the splinter! Mix some baking soda with enough water to form a thick and sticky paste. Apply the paste on the affected area using your fingers or a paper towel. Cover the area with a bandage or tape and leave it on overnight. The next morning, the splinter should come out easily when you remove the bandage. The deeper the splinter is embedded, the more time it will take to come closer to the skin’s surface. Repeat the steps if needed. Duct tape works like a charm if the splinter is not completely embedded in the skin. 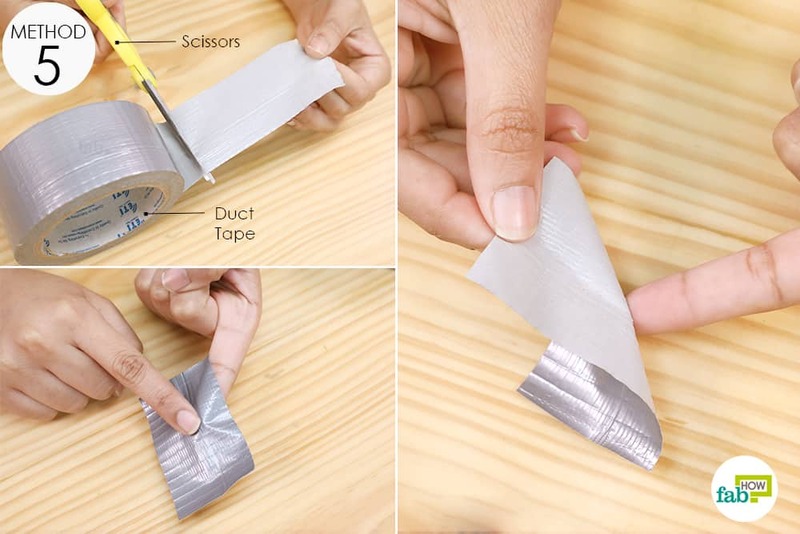 Put a piece of duct tape over the splinter and gently rub it using your fingertips. Wait 5 minutes before pulling off the duct tape in a single, smooth motion. 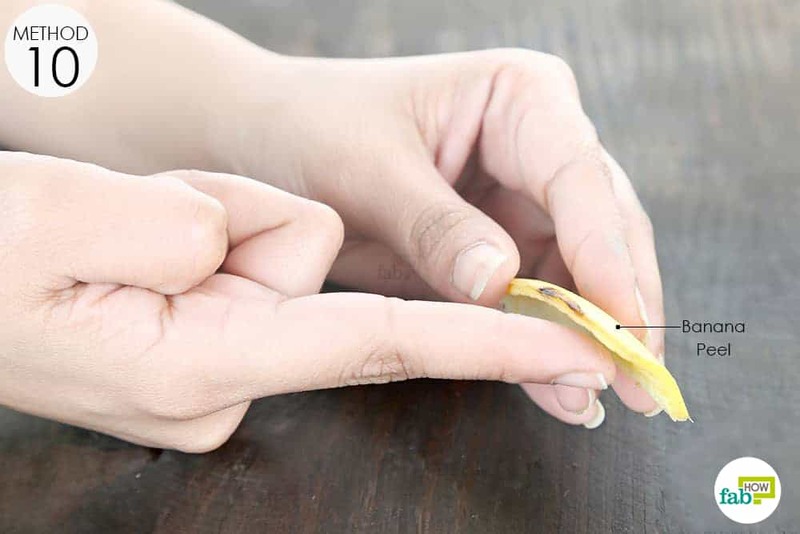 The splinter will stick to the tape and easily come out when you pull it off. Vinegar is among the most common remedies used to remove a splinter without pain. It works by causing the splinter to break through the surface of the skin. You can use either white vinegar or apple cider vinegar. 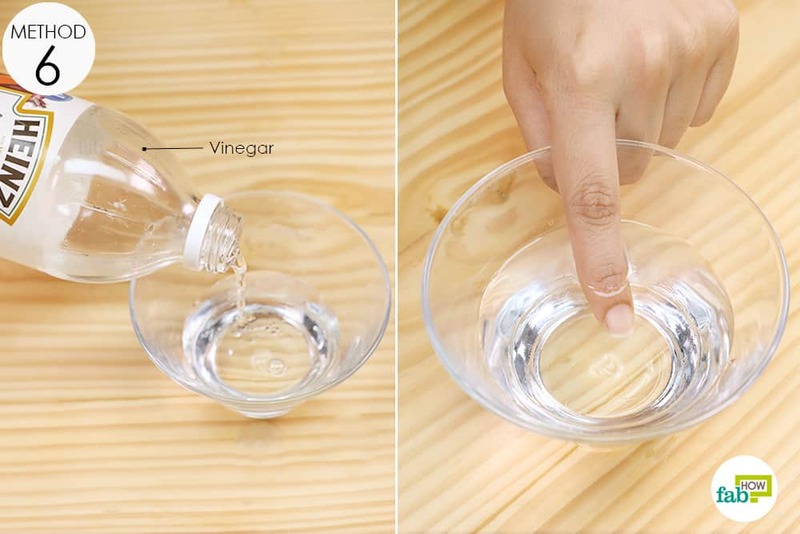 Pour vinegar into a bowl and soak the affected area in it for 15 to 20 minutes. If the splinter does not come to the skin’s surface, soak it for another 15 minutes. Epsom salt comes loaded with a number of therapeutic and healing properties. It is a natural anti-inflammatory and exfoliator. 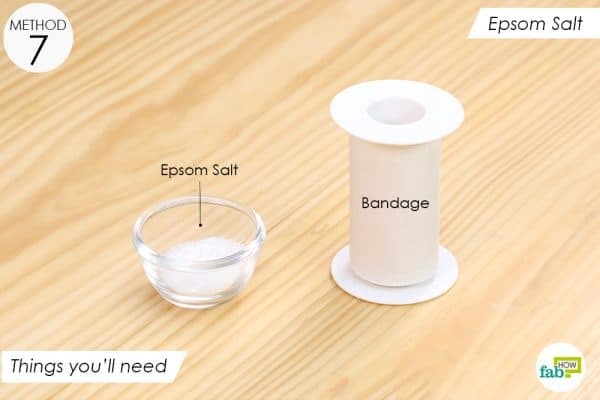 Epsom salt also comes in handy for removing splinters. It works wonders for deeply lodged slivers. It works by increasing the osmotic pressure on the skin, thus drawing foreign bodies toward its surface. Put Epsom salt on the affected area. Cover the area with a bandage or tape. Either the splinter will come out along with it, or it will come closer to the skin’s surface and can be pulled out with tweezers. Yes, potatoes can help you get rid of stubborn splinter stuck in your skin! The moisture in the potato pushes the splinter to the surface of the skin. Place a slice of raw potato on the area with the splinter. The fleshy part of the slice should be touching the skin. Apply a little pressure on the slice and keep it there for some time. It may take anywhere from 30 minutes to overnight for this method to work. 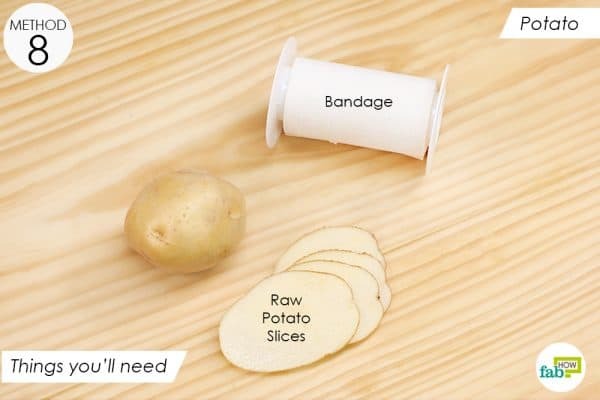 You may use a bandage or tape to hold the potato slice in place. 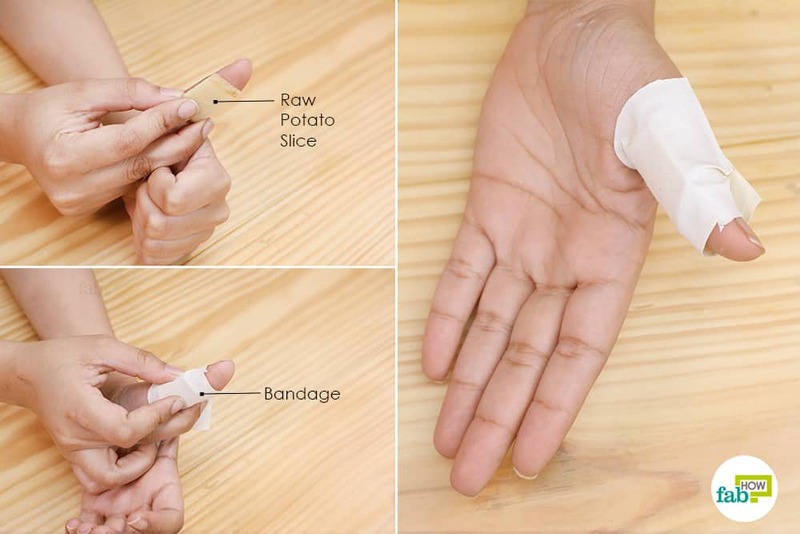 The splinter will pop out easily when you remove the potato slice. If this method does not work on the first try, give it another shot using a thinner slice of potato. Another method that can help you remove a splinter is a poultice made of bread and milk. 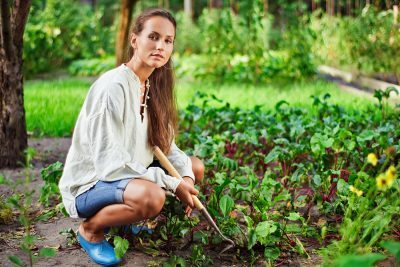 Many people learned this age-old method from their grandmothers. Heat the milk until it is slightly warm. 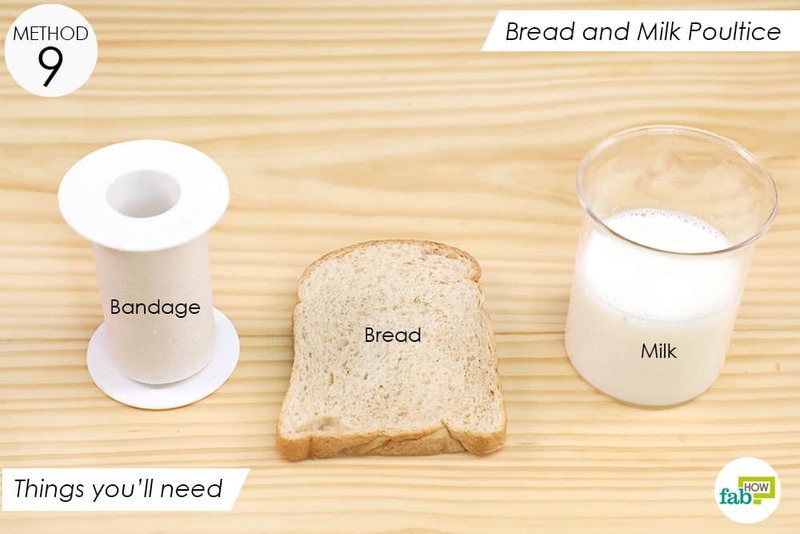 Pour the warm milk into a bowl. Break off a piece of the bread. Dip it in the bowl until it is soaked with milk. Place the moistened piece of bread on the affected area. Use a bandage, piece of gauze or tape to hold it in place. Leave it on the splintered area for as long as you can. The mixture will effortlessly draw out the sliver. Another tried-and-true method to remove splinters without pain is using a banana peel on the splintered area. Banana peel contains enzymes that will help bring the splinter to the skin’s surface. Place the banana peel (white side facing toward your skin) on the splintered area. Keep it in place using tape. Leave it on for 5 to 15 minutes. If needed, you may leave the peel on for a longer period. Remove the peel and pull out the sliver using tweezers. Honey is a natural antibiotic and comes with therapeutic and antiseptic properties. It helps in removing splinters effortlessly and painlessly. Apply a generous amount of honey on the splintered area. The honey will draw the sliver out. Drawing salve also helps deal with splinters by softening the skin around the affected area and exposing the sliver so it can be pulled out easily. Hydrogen peroxide can also be used to bring the splinter to the surface of the skin. Chan C, Salam GA. Splinter Removal. AAFP Home. https://www.aafp.org/afp/2003/0615/p2557.html. Published June 15, 2003. How to remove a splinter. Employment and benefits | American Academy of Dermatology. https://www.aad.org/public/skin-hair-nails/injured-skin/splinters. Cardia, Gabriel Fernando Esteves S-F, Euclides S, et al. Effect of Lavender (Lavandula angustifolia) Essential Oil on Acute Inflammatory Response. Evidence-based Complementary and Alternative Medicine. https://www.hindawi.com/journals/ecam/2018/1413940/. Published March 18, 2018. Disclaimer: The content on this site is generic, informational and adjunctive at best, but cannot serve as a replacement for professional medical advice. Any use of this information is at the user’s discretion. For health concerns or emergencies and medication changes, please consult a healthcare professional.